Lancelot ‘Capability’ Brown (1716-1783) is the iconic figure at the head of the English landscape style, a tradition that has dominated landscape design in the western world. He was widely acclaimed for his genius in his own day and his influence on the culture of England has arguably been as great as that of Turner, Telford and Wordsworth. Yet, although Brown has had his biographers, his work has generated very little analysis. Brown was prolific; he has had a direct influence on half a million acres of England and Wales. The astonishing scale of his work means that he did not just transform the English countryside, but also our idea of what it is to be English and what England is. His work is everywhere, but goes largely unnoticed. His was such a naturalistic style that all his best work was mistaken for untouched nature. This has made it very difficult to see and understand. Visitors to Brown landscapes do not question the existence of the parkland he created and there has been little professional or academic analysis of his work. This book for the first time looks at the motivation behind Brown’s landscapes and questions their value and structure whilst at the same time placing him within the English landscape tradition. It aims primarily to make landscape legible, to show people where to stand, what to look at and how to see. Those who have had the pleasure of meeting John Phibbs and hearing him talk will know that Lancelot 'Capability' Brown has no greater fan or more eloquent advocate ... 'Place-making' demonstrates not only the vast scale on which Brown and his labourers worked, but also the ingenuity, variety, and unequalled sheer beauty of his creations, and is essential reading for anyone seeking a fuller understanding of England's most famous but elusive landscape designer. This book, long awaited and many years in the making, is awe inspiring in its scope, depth and detail. ...The publication is undoubtedly handsome, with a wealth of illustrative material both historical and modern. 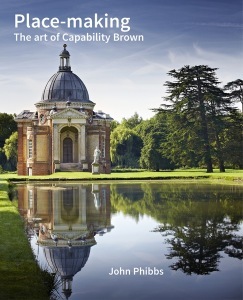 ... the book is essential reading, to be used primarily as a source of reference, for anyone studying Brown and his landscapes, or indeed the eighteenth-century landscape garden generally. ... it is greatly rewarding to be able to enjoy the fruits of so much thought, knowledge and experience. Luxuriously illustrated with drawings, plans, engravings, photographs and paintings, the book beautifully brings to the light the highlights of Brown's long career as a landscape designer. The author is the greatest living expert on Britain's greatest gardener ... Place-Making is the vessel into which John Phibbs has poured all of his retained knowledge and opinions. As a result, it's an important record that will, I'm sure, have a purpose and reputation long into the future after more lightweight volumes have been published and fallen by the wayside ... What is fascinating is the way in which he has performed an anatomical, forensic analysis of Brown's work, slicing open every minute part of the body of his landscapes and chronicling them, both individually and as parts of a whole. ... Phibbs has an extraordinary detailed knowledge of each of the parks altered by Brown ... Phibbs has done a very thorough research work in local archives in order to unearth the slightest testimony on Brown's activities and pronouncements. ... usefully challenges received ideas.